Navy Adm. Ron Boxall, surface warfare director OPNAV N96, has said the service’s first Future Surface Combatant ship would have the space, weight, power and cooling capacity to integrate laser guns, radars, an electromagnetic railgun and other weapon systems, USNI News reported Wednesday. 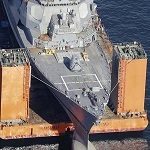 The service branch plans to procure its large surface combatant in 2023 and Boxall said the Navy would not speed up development work on new weapons in order to keep pace with the construction of the new ship. 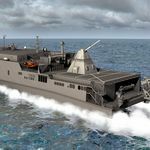 “So I’m inclined to say, as long as we build it modularly, we’re going to make those assessments in stride,” Boxall said of potential integration of new weapons. “But I don’t want to get too crazy about trying to accelerate new technology in the first of the class as we change hulls, which will hopefully be a hull that will be with us for a very long time,” he added.